Oscar was born over the weekend and as of today I’ll be blogging at growingsideways.wordpress.com. Looking forward to seeing you over there! As a recently minted husband and a new father, I’m interested in trends around marriage and childbearing. The 2010 Census has yielded a host of interesting patterns (detailed Census report here) in this regard: marriage rates are down for people of all demographics; marriage rates are down most dramatically among Americans with the lowest educational attainment (46% of Americans with a high school diploma or less are married, compared to 64% of college graduates who are married); Americans of all stripes are getting married later in life (the average age of marriage for men is 28, for women 26); successful marriages are increasingly concentrated among Americans with the most education (a college degree or more). 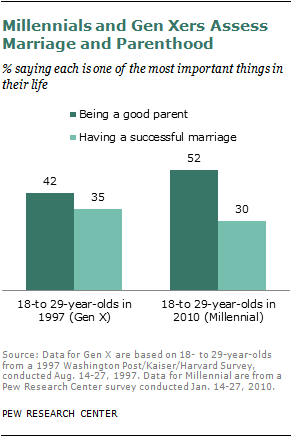 One of the most interesting pieces of analysis around marriage and childbearing trends comes from a survey by the Pew Research Center that found that members of the Millenial Generation (roughly speaking anyone born between 1980 and 2000) believe that being a good parent is more important in life than having a successful marriage: 52% of Millenials said being a good parent was one of the most important things in life while only 30% said the same thing about marriage. This roughly tracks with Census trends which show that Americans are getting married later in life and less often overall and also increasingly having children outside of marriage. It’s possible, then, that there’s a tension between what Millenials prioritize (children over marriage) and what will make them happy. At the same time, it’s also possible that Millenials have soberly concluded that while a happy marriage might not be possible for them, they don’t want that to mean they have to miss out on having children too. Last Saturday morning James and I went down to Taney Park along the Schuylkill River. He insisted on walking to start but got tired halfway there and hopped aboard his tricycle. When we arrived the playground was nearly empty (I’m always surprised that dog owners are outside on weekend mornings far earlier than toddler owners) and James was bored. He had no interest in going down the slide; there were no kids whose toys he could try to steal; he picked up a pine cone and then dropped it. Then he saw a group of kids running around on a nearby baseball field and he perked up. “Yook kids,” he said, pointing. So we walked over to the chain link fence and watched the early innings of a tee ball game. The kids were about six years-old though they looked like mini-Major Leaguers. They had on yellow and blue team shirts with the logo of a local business sponsor on the front and a number on the back. There were matching caps; most of the kids had on polyester baseball pants; a few even sported eyeblack. Whenever I see kids even just a little older than James I can’t imagine how he’ll eventually turn into them. This has been true all along: It seemed impossible that he’d ever walk until one day he did; when he was born some friends gave him a Nike sweatsuit that was so big we stowed it at the bottom of a drawer thinking maybe he’d grow into it before he went to college. This spring I pulled it out, tags still affixed, and was shocked to discover that sometime, probably over the winter, his head had become too big to fit through the top of the shirt. Kids of any age are a funny combination of skill and incompetence. When the tee ball sluggers stepped up to the tee they looked like pros: Their legs perfectly spaced, the bat cocked and wagging in their hands, their eyes bearing down on the pitcher who wasn’t actually there. Then they’d swing and reality was restored. Most of them hit the tee beneath the ball, which is one of the feeblest feelings in all of youth sports, for players and spectators alike. One of the dad/coaches would run quickly onto the field to replace the ball on the tee before the kid grew too discouraged. Everyone made contact eventually. Once you put the ball in player there was zero chance the fielders were going to get you out. After a few batters James became more interested in the gravel along the bottom of the fence than the game, but I kept watching. I would have imagined a tee ball game as one big scrum but they actually did a good job holding their positions, just like the Phillies do. I was curious about how they’d been assigned positions: Why was one kid directed to shortstop and another told to go play right field? On what basis was the kid with the knee-high stirrups made catcher? The assignments were probably fairly random but also consequential. In a couple years they’d be in Little League and the coach would ask them what positions they’d played before and the catcher would say catcher and the shortstop would say shortstop and the right fielder would kind of lie and say he didn’t really have a position. The process by which a child’s future possibilities winnow and branch goes on all the time; it just seemed particularly apparent to me that morning watching the baseball game. But Saturday morning at the tee ball field I had the opposite feeling. For the kids I’m sure it was thrilling to step up to the tee and know that whether the ball flew or sunk was completely up to them; it seemed thrilling for the dads, too, who cheered and encouraged like it was Game 7 of the World Series. But for my part I was happy—for that day at least—to have James at my feet throwing gravel at the grass, and to know that in a short while he’d mount his tricycle and I’d push him home. They will never be 8 years old again. Nor do you want them to be. Not really. Just a bit. James’ turned two just last week, so it’s not quite time to worry about how I’ll handle things the first time we have a beer together. In her essay Browning says that one of the keys to the success of the trip was that she let her twenty-six-year-old son Alex plan the itinerary as a way to show that she considered him an adult. This morning I let James plan the walk to daycare and it was a disaster. It took 20 minutes to walk two blocks and the experiment ended with him screaming in my arms, “I wanna touch it,” as I hauled him away from a pile of dog poop. Even though we’re a few years away from traveling together as equals, I still think about how the relationship James and I have now will translate once he’s an adult. The first two years of his life have passed in what feels like almost not time at all; I imagine the next 16 will, too. Given that James will have no choice but about spending time with for only a relatively small percentage of the years we have together, I want to make sure that the relationship we form while he’s young sets the stage for the relationship I hope we’ll have when he’s older. I don’t have any particularly keen insights for how to accomplish that. As parents we probably have less to do with that process than I think. (Maybe one-third of a child’s eventual happiness owes to his parents, with the rest just alchemy?) But in the day-in-day-out sometimes slog of parenting I find that thinking about the relationship I’ll have with James when he’s older is a useful way to remind myself of a larger point: that Caroline and I are raising a child whose life is ultimately his own. Disciplining a toddler with timeout: smart or soft? Almost nothing stays with a kid longer than the feeling of being punished by his parents. What I remember most is not the particulars of the punishment—a spanking, a bar of soap, not being able to drive for a month—but the feeling of having done wrong in my parents’ eyes. Even at 30 it would still hit me hard if my dad were to let me know that he thought I’d acted badly. Now, I didn’t receive timeout as a kid but Caroline and I have taken to using it as parents. I think of it as one of the stereotypical practices of middle class American childrearing. I’ve read several academic studies about parenting recently and in the compare and contrast between American-style parenting and parenting styles in other parts of the world, “time out” is always listed as a key distinction between the way we raise our children and the way the Kalahari bushmen raise theirs. If it’s not on Stuff White People Like it should be. So I felt like a bit of a caricature yesterday as I gave James timeout for throwing his cup in the dishwasher. When his minute was up I turned his seat back around and asked him if he knew why he’d been given timeout. “No throw cup a dishwasher,” he said. “That’s right,” I replied, pleased to hear that the time he’d had to contemplate his misdeed had clarified things for him. “We don’t throw the cup in the dishwasher.” The grin on his face told me that he was already plotting his next projectile. So which approach is better? I’m not a timeout kind of parent by disposition but I’ve warmed to its merits. I like that with minor events like the dishwasher incident timeout keeps the interaction between me and James simple and more predictable. As he gets older and the lessons he learns grow more complex I hope I’ll keep in mind how powerful my parents’ judgments were to me as a kid (both when they’d praise me and when they were angry at me), and be conservative in how and when I express my own judgments to James. At the same time, I know that I’m going to be an integral part of James’ moral world as he grows up, and that my responsibility to him is as more than an umpire who dispassionately calls strikes and balls in his behavior. It’s rare that Caroline and I run errands together in the city. Usually when one of us goes out (and brings James along) it’s an occasion for the other to get some work done. But on Friday afternoon we were all eager to get out of the house so we set off together get ingredients for dinner that night: a cold pasta salad with shrimp, feta, olives and dill. 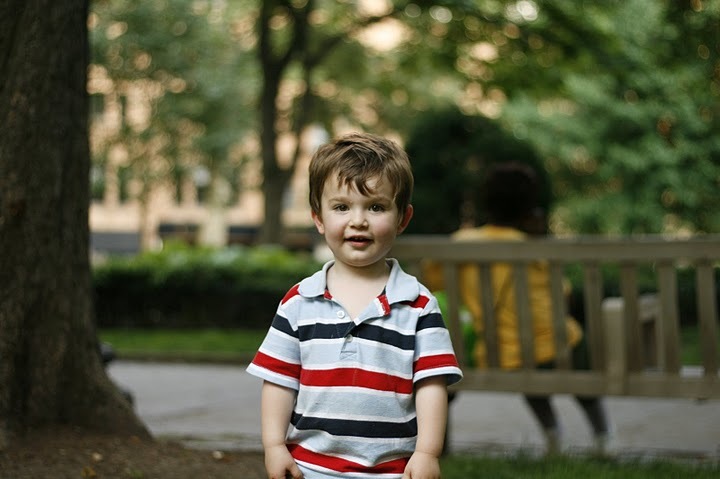 James resisted getting in his stroller, as he often does, and rather than cajole him we let him walk alongside us. He took my index finger in his hand and with Caroline pushing the empty stroller beside us we walked slowly down the block. At the first intersection the cross light was just turning yellow. Normally I would have zipped across at the last second, but that’s hard to do with James at my side. So we waited a minute and watched the cars go by. “Yellloow taxi cab,” James said excitedly as one and then another sped by. The book is a series of minor adventures. He bumps into a stone wall, bakes in the sun, cools in the rain. The land is littered with pie-shaped pieces but none turn out to be his missing piece: one is too sharp, another is too small, one is too square, another is too surly and rejects him. And they do fit. And because the circle is now complete he rolls along faster than ever before, so fast that he can’t stop to talk to his old friend the beetle or say hi to a butterfly. Worst of all, the addition of the new piece means that when he tries to sing, the words come out garbled because his mouth is now full of piece. This leads to an epiphany. “‘Aha,'” it thought. “‘So that’s how it is! '” The circle places the new piece gently back down on the ground and then rolls on, slowly, without it, still singing his song. The simple idea conveyed by the book—that the things we want most are the things we cannot have—has stayed with me more powerfully than just about any story I’ve ever read. The walk to the grocery store took twenty minutes, about twice as long as it usually does. Once inside James tried to knock over a tower of canned tomatoes, so I picked him up. Caroline got a cube of feta at the cheese counter and a carton of grape tomatoes. James watched her as she began to scoop oily kalamatas from a barrel into a shallow plastic container. “I wanna watch, I wanna watch,” he said in an urgent voice, straining to look over my shoulder to get a better look at what Caroline was doing. It occurred to me that if you’d never seen a barrel of olives before, as he hadn’t, then for a moment it might appear to be the most interesting thing in the world. Maybe there is no getting back the wonder of childhood, but after we’d finished our grocery shopping and returned home, it occurred to me that having a child helps. When I’m by myself I try to get where I’m going as fast as I can and I pay attention to just what’s necessary to carry out the task in front of me, but walking with James changes my pace and my perspective. At the same time, I wouldn’t want to inhabit James’ world all the time; I like being able to separate the wheat of experience from the chaff, and to use the room such sorting creates to think about, among other things, how different his world is from mine. The best part of the book for me was learning more about bees. My prior knowledge was so limited that I hadn’t even put it together that “Clover Honey” means honey that was produced by bees who got their succor pollinating fields of clover. There are, as it turns out, nearly as many varietals of honey as there are types of flowers. Among them one of the most noxious and inedible is said to be honey produced from onion blossoms. Migratory bees pollinate $15 billion of crops every year, and make possible 1 in every 3 bites of food from each summer’s harvest. Given the importance of migratory beekeeping to food production, I was particularly surprised that pollinators-for-hire only became a big business in the late-1990s. Every January two-thirds of the nation’s bees are trucked to the Central Valley in California to pollinate almond trees. Growing Sideways is about parenting and family life. Posts range from first-person stories and reflections on marriage and fatherhood to discussions of broader cultural topics that touch on family life. The author, Kevin Hartnett, lives in Philadelphia with his wife and their two-year-old son .